1. Exercise like crazy before and after you eat it. 2. Be careful about your choices, where you buy it and how much you eat. I exercise, but I will not exercise like a madwoman over pizza…so I am careful. First thing you have to know, is WHAT ARE YOU EATING? A slice of Costco Pizza is one of the worst. 70g of carbs. Domino’s Thin Crust Cheese Only Pizza from a medium pizza is one of the best at 15g of carbs. So, where you get your pizza from is important. If you go to a ma and pa neighborhood pizza joint and eat pizza, you might not know what the contents are in that slice. Remember, wheat is involved, so you have to be careful. This should be a treat, not a regular food choice. Second thing is that you find places you want to go to and ask for info on their nutritional content if you can’t find it or get it easily. I found a place nearby called Pizza Rev. They have gluten-free pizza (which is getting more popular). I contacted the company because they don’t have their nutritional content available yet. The company said that their gluten-free standard personal cheese pizza is 40g of carbs. So, if I eat half of that and some salad, I am doing great. So, I have been there now 4 times and I haven’t gained weight, in fact, I worked it in with my 50 to 100g of carbs a day and I actually went down a few ounces. I only add certain veggies and meats, which are low in carbs. Here is a site where they give a lot of the carb and calorie content: http://www.calorieking.com/calories-in-pizza.html So do your HW before you eat. Losing weight and staying skinny is about not being lazy about food choices. Here is an example of something that could fool someone. California Pizza Kitchen. The thin-crust Margherita pizza. You would expect it to be low (not gluten-free). The entire little pizza is 1038 calories, 98g of carbs. Even if you only ate half–that is 519 calories and 48g of carbs all in one go. You will not lose weight, you might even gain that day depending on what you eat the rest of the day. Subway has a 6 inch pizza (who knew?). It is 680 calories and 96g of carbs in that little pizza. But, here, for the kids at Olive Garden, the Kid’s Pizza. Should be light and not that bad, right? No– it is 420 calories and 64g of whopping carbs for the kiddies. No wonder why America is getting so large. ONE slice at Chuck E Cheese is 169 calories and 24g of carbs. That isn’t bad, but what kid only eats ONE slice? How lean is a Lean Pocket pizza? 41g of carbs for the whole pizza sandwich. So, you can eat out, but be careful where and what you eat. 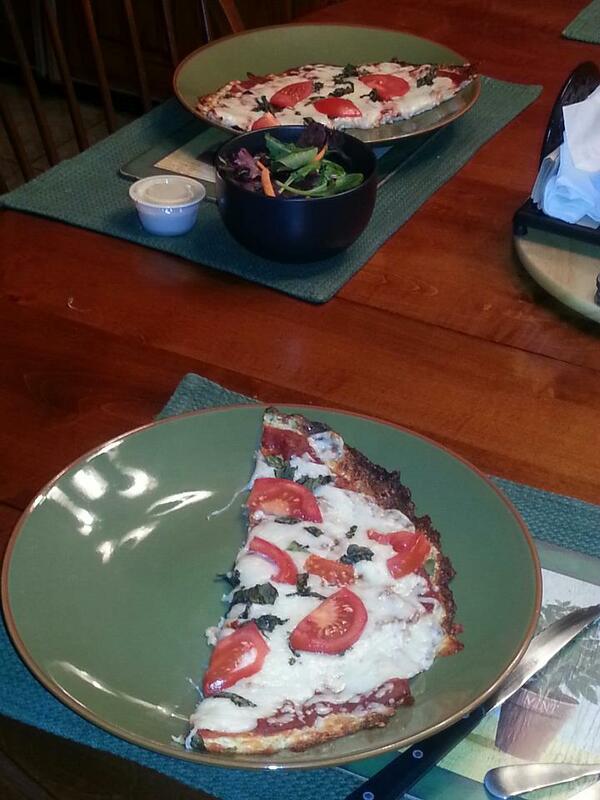 Below was my caulfilower-based home-made Margherita pizza and salad that I shared with my husband. Less than 5g of carbs per half of that 9 inch pizza. Totally delish and low carb. The base was delish and didn’t miss the pizza crust. But, if you have to have pizza crust–go online and type in low carb pizza crust and up pop a lot of sites that sell them online. Even try Amazon.com–they sell everything.